List the challenges sales reps face when trying to prioritize leads. 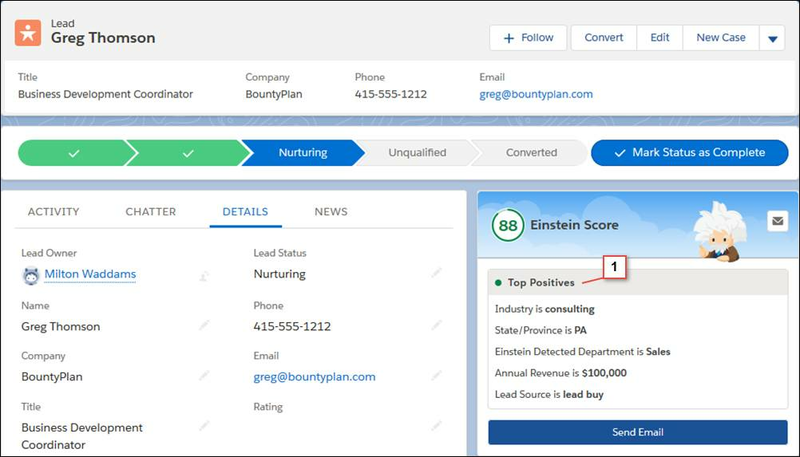 Explain how Einstein Lead Scoring makes your sales team smarter when working leads. Explain how sales reps will know where lead scores come from. You’ve explained to Ava how Sales Cloud Einstein automates the sales team’s busywork. Now you have to show how AI helps sales reps work smarter on the more important work of nurturing leads. You take a trip upstairs to visit your colleague Pepper Black, one of Honeydew’s top sales managers. You ask Pepper what key challenges she and her team face in trying to turn stacks of new leads into potential deals. Pepper tells you that while her sales team has an effective process for gathering leads, a core challenge is knowing which of those leads to prioritize. Without that knowledge, her team spends a ton of its time on leads that don’t pan out. When you press her for more details, she explains the challenges she faces. Her sales team has many more leads than they have time for. They don’t know which lead characteristics indicate a higher chance of closing a deal. Their attempts at prioritization have met with mixed success. They aren’t sure which prioritization method is most appropriate for Honeydew’s business. Some of her sales reps have enough experience to know which leads have the highest likelihood of purchasing. They focus on leads in urban areas or from certain kinds of food businesses, for example. But this method is far from perfect, and many reps aren’t experienced enough to have this kind of feel for leads. They’ve tried rules-based prioritization, but the rules they used were also based mostly on educated guesses and intuition. They’ve tried sorting by geography or by lead source, but these methods left some potentially hot leads unattended. The rules they came up with lacked sophistication. Finally, Pepper mentions that the marketing department has even tried scoring leads as they come in, but only with a numeric score. Sales reps don’t have a clear idea how a given lead earns its score. Not knowing where the score really comes from makes it hard for reps to trust the scores. They want more information about what makes a lead hot, information that might help them break the ice during that first call. As you listen to Pepper’s description of these challenges, you can tell she doesn’t notice the widening smile on your face. You’re smiling because Sales Cloud Einstein can really help her team turn their leads into opportunities faster. At last, Pepper takes a breath. You fill her in on your project to add AI to Honeydew’s secret sauce. You tell her that Sales Cloud Einstein includes Einstein Lead Scoring. This feature applies the power of AI to analyze your history of lead conversions and find the true patterns in those conversions—patterns you probably had no idea existed. And because Sales Cloud Einstein already understands the format of your lead and opportunity data, it can start analyzing and finding patterns almost as soon as you turn it on. You explain that Einstein Lead Scoring gives each lead a score based on how well it matches your company’s particular lead conversion patterns. The higher the score, the hotter the lead. All your sales reps have to do is sort their leads by Score and start at the top of the list. Lead scores in a typical leads list view (1), along with the reasons behind the score (2). The lock (3) shows that the lead score is read-only. Pepper is still a bit skeptical. She wants to know how her sales reps will be convinced that they can trust the scores. You tell her that Einstein Lead Scoring shows you exactly which details about each lead have the greatest effect on its score. So your sales reps can see the patterns that have been hiding in your data all along. These are the real insights. Lead scores and their predictive factors are visible not just in list views, but also on detail pages. So the information stays handy whether reps are sorting leads or getting ready to make a call or send an email. The Einstein component on a lead detail page. Each score includes the field values that affect the score most (1). As your team continues to convert more leads over time, Einstein Lead Scoring constantly adjusts its analysis in order to discover any new patterns that emerge. Pepper starts wondering if you can measure the overall impact of lead scoring on the business. Can you easily tell whether leads with high scores are actually converting at a higher rate? You love being able to grant her every wish. You tell her that Einstein Lead Scoring includes both an operational dashboard and an Einstein Analytics dashboard with reports that show you your conversion rates by lead score and average lead score by lead source. And you can even see the distribution of lead scores among your converted and lost leads. So it’s easy to see how lead scores are correlating to your bottom line. Pepper is impressed. She’s starting to think Einstein Lead Scoring can really spice up her teams’ process and bottom line. Now she wants to know what else Sales Cloud Einstein can contribute to her tool box. Can Einstein help her team even after they’ve converted a lead? Use these resources to learn more about Einstein Lead Scoring.